Sharjah: Barely hours after he impersonated a police officer to rob a car cleaner, a man tried to steal money from a second car cleaner in the same neighbourhood, but this time he was caught on CCTV camera. 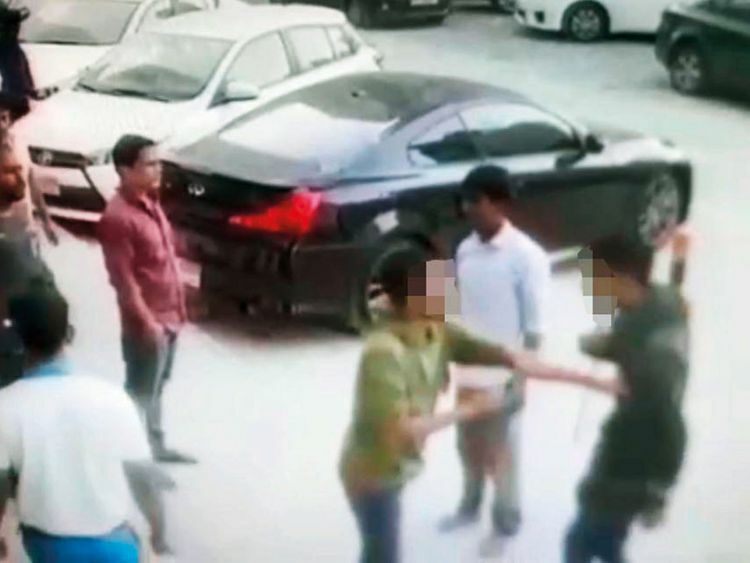 Not content with the Dh4,000 his three-member gang looted from a Bangladeshi in the wee hours of January 26, the suspect, deciding to go solo, returned to the crime spot in Sharjah’s Al Taawun area around 8am to target another car-cleaner. However, his bluff was called out when the car cleaner raised an alarm and a crowd of curious onlookers gathered at the place. Some even confronted the man. Sensing danger, the fake policeman suddenly took to his heels and disappeared. The whole incident was caught on a CCTV camera installed in a building overlooking the sandy parking lot behind Wilson Hospital. A complaint was later lodged with Sharjah Police which is now examining the video footage. In a statement to Gulf News, Sharjah Police said impersonating security officers was a serious crime and they are committed to root out the menace. To counter the problem, the Sharjah Police have even launched a campaign called ‘Is it a Real Policeman?’. Police said the move is aimed at creating awareness among people and educating them so that they could tell a fake policeman from a real one. “Even if they are in civilian clothes, police officers are required to carry an identity card displaying their picture, name and a personnel number. Always ask for the ID, and be wary if someone who says they are a police officer asks you to hand over your personal belongings such as your wallets, money or cell phone,” a Sharjah Police spokesman said. “Police impersonators mostly target people who do not have adequate knowledge about legal procedures taken by the police. A real police officer will not stop anyone except under exceptional circumstances or by authorisation of the public prosecutor. At best he may ask for your identity card, driving licence or vehicle registration but nothing beyond that. Police said they are distributing booklets in Arabic, English and Urdu alerting residents about police impersonators. “As part of the campaign we are also putting up awareness posters in public places like malls and medical centres,” he said. Between 2014 and 2015, Sharjah Police registered 26 cases of police impersonation. Of late, the numbers have declined sharply as overall serious crimes fell by 45 per cent during 2017. But the police don’t want to take any chances. Lieutenant Mosabah Rashid Al Yamahi of Sharjah Police has come up with a detailed study titled ‘Reasons to Impersonate Police Personnel in Industrial Areas and its Effects and Dangers on the Security Situation in Sharjah’. The study has come up with several recommendations. These include educating community members on how to differentiate a real police officer from a real one, raising awareness about the issue and giving tips to people so that they don’t end up as victims of police impersonation. Ask for the ID. Regardless of rank, all police officers are required to carry an identity card displaying their picture, name and a personnel number. Be wary if someone claiming to be a police officer asks for your personal belongings. At best a police officer can ask for your identity card, driver licence or car registration. If you are unsure of the identity of someone who claims to be from the police, report the matter to the nearest police station. Alternatvely call 999 or Najeed 800151 or text 7999.